Ranji Trophy champions Mumbai scalped two quick wickets to take the driver’s seat against the Rest of India at the end of the third day of the Irani Cup tie being played here today. Mumbai captain Sachin Tendulkar plays a shot during the Irani Cup match in Chennai on Saturday. Tendulkar followed up his first innings 94 with another half century as Mumbai set Rest of the India a challenging target of 340 for victory. South Africa called off their cricket tour to Pakistan today, citing security concerns following a bomb blast in Karachi yesterday, the SAPA news agency reported. The President of the United Cricket Board of South Africa, Ray Mali, said the security situation in Pakistan had deteriorated to an unacceptable level and South Africa had no alternative but to call the tour off. Rajasthan and Punjab Cricket Club (PCC) won their league fixtures on the second day of the 10th All-India J.P. Atray Cricket Tournament being played at three different venues. The Netherlands made no mistake in defeating India 3-0 to remain in the Davis Cup World Group here today. Putting behind poor showing at Champions Trophy and absence of Jugraj Singh, a confident but not complacent India open their campaign against China in the 6th edition of the Asia Cup hockey here tomorrow with that the hope that this time they will go back home with the trophy. Ace hockey star, Jugraj Singh who is recuperating here at the Dayanand Medical College and Hospital after sustaining multiple injuries in a car accident near Jalandhar city on September 2, will be flown to the USA next week for physiotherapy. The 33rd SN Vohra's All-India Gurmit Memorial Hockey Tournament will begin tomorrow at the Sector 18 hockey stadium here. As many as 24 teams from all over India have confirmed their participation. Fourteen-year-old Ajeetesh Sandhu, who turns 15 next month, has done it again. Yes, this subjunior Chandigarh golfer today clinched the Category A and Category B titles in the Chandigarh Junior/ Sub-junior Golf Championship which concluded at the Chandigarh Golf Club course here today. Local hero Karandip Singh and defending champion V.R. Naren Kumar, both from Team MRF, fought an intense battle for the first day. The Power M1 Challenge here today. Karandip managed to finish 13 second ahead in the first leg of this fourth round of the motorsports Association of India’s Indian National Rally Championship, organised by Motorsport one. Ch Devi Lal Gold Cup Senior Men Freestyle Championship will be held in New Delhi from September 24 to 26. Nearly 100 participant from 15 countries are likely to participate. The thrice-postponed South Asian Games to be held in Pakistan next year. The ICC decides to expand the 2007 Cricket World Cup to 16 teams. After being bowled out for 244 in their second essay, with an overall lead of 339, Mumbai bowlers struck immediate blows to leave the Rest of India stuttering at 55 for two at stumps. Rahul Dravid (16) and L. Balaji (0) were at the crease at stumps after the dismissal of Virender Sehwag for 36 and the other opener Sanjay Bangar for one. Ajit Agarkar trapped Bangar leg before in the second over of the innings. Dravid and Sehwag build up a partnership of 50 runs for the second wicket, with the latter doing the bulk of scoring. However, Sehwag could not sustain the momentum and departed, driving straight to Ramesh Powar at covers off Robin Morris. Earlier, Mumbai was bowled out for 244 just after tea with off-spinner Harbhajan Singh claiming 4 for 79. Master blaster Sachin Tendulkar scored a 50. For Mumbai, Romesh Powar top scored with 57 while master blaster Sachin Tendulkar and leg-spinner Sairaj Bahutule chipped in with 50 and 36, respectively. Earlier, in Mumbai’s second innings, Harbhajan Singh ran through the tail to end up with figures of four for 79 in 25 overs. Laxmipathi Balaji (2 for 23) and Anil Kumble (2 for 66) played the support cast to perfection. The highlight of the day’s play was a fine batting display by Tendulkar and Ramesh Powar who made a cracking 57. Sairaj Bhatule chipped in with a useful 36, while Powar and Ajit Agarkar (22) put on 43 runs for the eighth wicket in 11 overs. Mumbai had a setback after lunch as Harbhajan Singh and Zaheer Khan dismissed Nishit Shetty and Tendulkar for the addition of only six runs. Ganguly brought on Harbhajan Singh to bowl the first over after lunch, replacing Kumble from the far end. This move paid dividends, as Nishit Shetty departed to the second ball, playing forward and giving a thick edge to Yuvraj Singh at forward short leg. He made 17 runs (three fours). Zaheer Khan continued his third spell from the pavilion end. 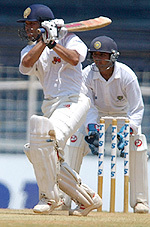 Tendulkar reached his 50 with a straight drive, to bring up his 80th half century in first-class cricket in 198 appearances. But he departed in the next delivery, failing to keep his flick off Zaheer Khan down and was caught by Balaji at square leg. Tendulkar had taken 147 minutes and faced 109 balls for his 50, which contained five hits to the fence. Later, Bahutule and Powar quickened the scoring rate, the 50 run stand coming off 61 balls in just 44 minutes. Fall of wickets: 1/11, 2/15, 3/81, 4/81, 5/109, 6/115, 7/199, 8/242, 9/244. Bowling: Zaheer Khan 16-2-44-1; L Balaji 8-3-23-2; Harbhajan Singh; 25-5-79-4; Anil Kumble 22-3-66-2; S Bangar 3-0-15-1. Fall of wickets: 1/1, 2/55. South Africa called off their cricket tour to Pakistan today, citing security concerns following a bomb blast in Karachi yesterday, the SAPA news agency reported. The President of the United Cricket Board of South Africa, Ray Mali, said the security situation in Pakistan had deteriorated to an unacceptable level and South Africa had no alternative but to call the tour off. “But the safety of our players is our primary concern,” Mali said. South Africa would have been the first western team to tour Pakistan since May 2002, when New Zealand cut short their tour after a bomb outside their Karachi hotel killed 15 people. KARACHI: The Pakistan Cricket Board (PCB) slammed South Africa’s decision to cancel its cricket tour over a minor bomb blast in a city office block, deriding it as “uncalled for and disappointing”. Rajasthan defeated IOC, Mumbai, by seven wickets at the PCA Stadium, Mohali, while PCC defeated Associated Banks by 62 runs at the Sector 16 Cricket Stadium here. Rajasthan and PCC collected five points each including a bonus point. Brief scores: Indian Oil Corporation: 204 for nine in 50 overs, (Mithun Virola 54, Mayur Khadke 30, Mandar Phatke 24; Anup Davey 3-41, Shamsher Singh 2-30, Rahul Kanwat 2-36). Rajasthan: 205 for three in 34.5 overs (Siddarth Joshi 111 Rohit Jalani 69; Rakesh Solanki 3/26). Siddarth Joshi was declared the man of the match. Punjab CC: 230 for seven in 50 overs (Amardeep Sonkar 51, Reetinder Sodhi 53, R. Ricky 31; B. Akhil 2-45, anand Kati 2-31). Associated Banks: 168 all out in 42.1 overs. (B. akhil 64, Jatin Saxena 41; R. Sodhi 4-38, Harikishan Kali 4-21. PATIALA (OSR): Young southpaw Udey Kaul steered PCA Colts to a narrow three-wicket win against Piccadily Cricket Club in a low scoring group C league match at the Dhruv Pandove Stadium here. Brief scores: Piccadily CC: 157 all out (Rahul Arora 34, Randeep Singh 28, Sanjay Gill 21; V.R.V. Singh 4 for 31, Gagandeep Singh 2 for 31, Ishan Malhotra 2 for 28). PCA Colts: 158 for 7 (Udey Kaul 29 n.o, Ankur Kakkar 24, Gaurav Gupta 25; Farman Ahmed 4 for 43, Rahul Arora 1 for 23, Shashi Razdan 1 for 26, Sanjay Gill 1 for 22). Martin Verkerk and John Van Lottum teamed up to provide the winning point for the Dutch in the doubles, defeating Rohan Bopanna and Mahesh Bhupathi 4-6, 7-5, 7-5, 6-4. The Netherlands remain in the 16-strong World Group while India stay in Asia/Oceania Zone Group 1. It was all uphill for the Indian pair after Verkerk and Dutch No 1 Sjeng Schalken won the opening day singles against Bopanna and Prakash Amritraj, but they got off to the best of possible starts. 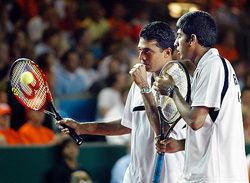 Bhupathi, ranked world No 8 in doubles and Bopanna, who was called in as a replacement for Leander Paes, took advantage as a tired-looking Verkerk struggled to get into the match. 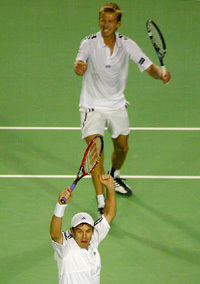 But the Dutch pair moved up a gear in the second set to take control of the match roared on by a 5,000-strong crowd. In both the second and third sets, the Dutch led 6-5 on the Bhupathi serve and on both occasions they took big risks to make the break. “It is time we break the jinx. We have been runners up four times and bronze medallist in the last edition and now we should win the Cup,’’ said coach Rajinder Singh. It was in this city way back in 1975 that India had won their only World Cup title and Rajinder is hopeful that “luck will smile on his boys this time so that they will win the Asia Cup for the first time’’. “It is very crucial tournament. A title win here will give us a ticket for 2006 World Cup and players will not have to go through the World qualifier, “the coach said and added “the players understand it’’. The Indians are not underestimating China and they still have not forgotten the harrowing time they had to go through against the Chinese in the Asian games at Bangkok. Chinese have nothing to lose so they can create lot of problems for other teams. They simply crowd the defence and the rival forwards find it very hard to penetrate that wall. Indians need to start the campaign with a big margin victory as the goal difference can play an important role in deciding the final placing in the pool. Indians have mixed memories of Bukit Jalil stadium, the venue of the Asia Cup. They won the Champions Challenge Cup here which saw their return to Champions Trophy but they had a disastrous World Cup here last year. Ace hockey star, Jugraj Singh who is recuperating here at the Dayanand Medical College and Hospital after sustaining multiple injuries in a car accident near Jalandhar city on September 2, will be flown to the USA next week for physiotherapy. This was announced by Mr Randhir Singh, honorary secretary-general, Indian Olympic Association (IOA) who called on the injured player here today to inquire about his well-being. Mr Randhir Singh who had gone to Pakistan on a goodwill tour along with other members of the IOA was returning to New Delhi and halted at Ludhiana for some time. He remained with the ace drag flicker for about 20 minutes and assured him full cooperation and assistance on behalf of the IOA and the Union Government. He also held a detailed meeting with the panel of doctors headed by Dr J L Bassi, Head of the Orthopaedic Department who had operated upon the player. The panel informed Mr Singh that the patient was progressing well, and suggested that Jugraj should be taken abroad as early as possible for physiotherapy and rehabilitation. Later talking to the media, Mr Randhir Singh said a CD about the treatment of the patient prepared by the doctors here has already been sent to the USA for the experts’ views there. He announced that Jugraj would be flown next week to the physiotherapy centre at Colardo Spring, the USA. Reacting to a query on the issue of demotion of players employed with the state police who reportedly got out-of-turn promotions, Mr Randhir Singh remarked that the matter would be strongly taken up with the Punjab Government. The decision would be taken according to the rules laid down for the purpose and taking the court verdict into consideration. Every effort would be made so that no player would be forced to quit his post, he further said. About the IOA delegation’s visit to Pakistan, Mr Randhir Singh said people of both the countries were eager to resume sports ties. He expressed the hope that the IOA would soon get the nod from the Central Government to organise sports events, namely hockey, kabaddi, wrestling, football between the teams of Punjab of both the countries. When asked about the Afro-Asian Games to be hosted by Andhra Pradesh towards the end of this year, the IOA secretary informed that the preparations for this prestigious event were as per the schedule. Mr Randhir Singh was accompanied by Padma Shri Kartar Singh, Director, Sports, Punjab and Ramandeep Singh, former captain of the Indian hockey team, besides others. The 33rd SN Vohra's All-India Gurmit Memorial Hockey Tournament will begin tomorrow at the Sector 18 hockey stadium here. As many as 24 teams from all over India have confirmed their participation. They include Punjab and Sind Bank, Central Reserve Police Force, Punjab Police, Corps of Signals, Central Industrial Security Force, Indian Air Force, Rail Coach Factory, Northern Railway, Central Railway, Southern Railway, Western Railway, Air-India Academy, Punjab and Sind Bank Academy, Centre of Excellence, Patiala, Maharaja Ranjit Singh Academy, Amritsar, DAV Academy, Chandigarh, All-India Postal XI, ONGC, Bhopal XI, EME Jalandhar, Indo-Tibetan Border Police, Ropar Hawks, Shahjahanpur XI, and Chandigarh XI. Four teams, including Punjab and Sind Bank, CRPF, Punjab Police and Signals have been seeded directly in the quarterfinals while RCF, Northern Railway, CISF and Indian Air Force have been seeded in the pre-quarterfinals on the basis of their past performance. Among the new entrants are Southern Railway, ONGC, and Bhopal XI. According to the organising secretary, Mr YP Vohra, the five academy teams have been invited to provide exposure to budding youngsters. Mr Chander Shekhar, IG, senior vice-president of the Indian Hockey Federation and president of the Chandigarh Hockey Association will inaugurate the tournament. Tomorrow two matches will be played. Centre of Excellence, Patiala, will face DAV Academy at 2.30 pm while All-India Postal XI will square off with Maharaja Ranjit Singh Academy at 4 pm. The final will be played on September 29. As in the previous editions, prizes will be given to the best forward, best half-back, best full back and best goalkeeper. The most well-behaved team will also be given a special prize. From the quarterfinal stage, a cash prize of Rs 1000 will be awarded to the man of the match. Aruna Devi and Anil Kumar brought two bronze for India as China dominated the medals tally on the opening day of the two-day Asian Athletics Championships. Fourteen-year-old Ajeetesh Sandhu, who turns 15 next month, has done it again. Yes, this subjunior Chandigarh golfer today clinched the Category A and Catgegory B titles in the Chandigarh Junior/ Sub-junior Golf Championship which concluded at the Chandigarh Golf Club course here today. Rubbing shoulders with 17-to-18-year-old golfers from all over the country, Ajeetesh proved his mettle when he clinched the junior title by a margin of eight strokes. He returned a one-over card of 73 for a fourday tally of 296. His nearest rival was Gaganjeet Bhullar of Kapurthala, who had a tally of 304, followed by Himmat Rai of the Delhi Golf Club with a score of 307. This is the third time Ajeetesh has won the junior title this year. Ajeeetesh also won the Category B title for the 14-year-olds. 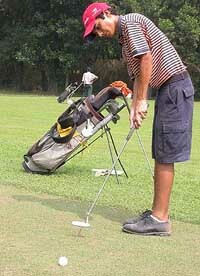 His nearest rival in this category was Fatehbir S Dhaliwal, who finished 14 strokes behind. Raja Malvinder Singh, President, Chandigarh Golf Club, who gave away the prizes, remarked that with Ajeetesh Sandhu and Fatehbir Singh Dhaliwal playing consistently good golf, the future of Indian golf was bright. He hoped these two youngsters would take over the mantle from Jeev Milkha Singh and Harmeet Kahlon in the near future. Jairaj Sandhu of the Black Elephant Golf Club, Patiala, at 6 years and 26 days, was the youngest player of the tournament. Category-A: Ajeetesh Sandhu 296, Gaganjeet Bhullar 304, Himmat Rai 307. Category-B: Ajeetesh Sandhu 296, Fatehbir S. Dhaliwal 310, Viraj Ghadhoke 319, Category-C: Rahul Bakshi 324, Kanishk Madan 330, Madhav Soi 335. Category-D: Viraat Badhwar 25, K Raghav Bhandari 266, Ankur Chadha 295. Though Karandip made light of the home advantage factor, he appeared to be totally at ease on the narrow twists and turns that made up the special stages in the mountains bordering Kasauli in Himachal Pradesh. “The stages are kept a secret and I have never driven them before, but today everything clicked for me,” said Karandip. Naren, who never lifted his foot off the pedal at any juncture, put things in the right perspective when he said, “There’s little I can do. He is just flying. The day’s proceedings, which were fast and furious, also claimed three cars, the first to go out was team Movva’s Rahul Kanthraj in the 1400 cc category with a broken shaft, followed by Team MRF’s Arjun Balu in the 1600 CC category and Rajiv Khanna in the Rally Star Cup. The 1400 cc category also threw up a surprise leader in Samir Thapar of JCT Rally, who led the class ahead of Lohit Urs and Rajiv Suri, Urs, who was leading the championship ahead of Kanthraj by two points at the start of the rally, chose to take it easy once the latter was out in the third stage, paving the way for Thapar to blaze ahead. Karandip, who was trailing Naren by three seconds in the spectator special stage, held late on Friday, conceded another three to the defending champion before he began his charge. The two drivers were level after four stages and Karandip then broke loose, making 10 seconds over Naren in the fifth and another 11 in the sixth stage. However, the classy Naren managed to pull back eight seconds in the last two stages to trail Karandip by 13 seconds. Karandip finished the eight special stages in 1:5.57 seconds, followed by Naren in 1:6.10 and Vikram Mathais in 1:7.38. Leelakrishnan was forth in the 1600cc with 1:8.17, followed by Gulf Chettinad’s Jiby Maliakkal, who clocked 1:11.46. The Fortis hospital team to lead by Dr Gurbir Singh, was all ready to provide medical assistance in case of need. Ch Devi Lal Gold Cup Senior Men Freestyle Championship will be held in New Delhi from September 24 to 26. Nearly 100 participant from 15 countries are likely to participate. The USA, Bangladesh, Iran and Uzbekistan have already confirmed their participations. The championship will be held in four weight categories of 55 kg, 60 kg, 66 kg and 120 kg. This was disclosed by Mr M.S. Malik, president, WFI, said here today. Mr Vikram Verma, Union Minister for Youth Affairs and Sports, had been invited as a chief guest and Mr Sahib Singh Verma, Union Minister, will be the guest of honour for opening ceremony, while Mr Om Prakash Chautala, Chief Minister of Haryana, will be the chief guest on the closing ceremony. The WFI was making efforts to ensure live telecast of the event on Doordarshan, he said. Indian grapplers have secured two berths in the 2004 Olympics after 12 years and at least four to five more wrestlers are likely to qualify, Mr Malik said. 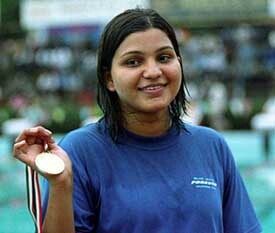 During the 16th Senior Asian Wrestling Championship in New Delhi India bagged four silver and six bronze medals. In Commonwealth Games in Manchester, India grapplers did well, winning three gold, three silver medals. In the fifth International Victory Wrestling Tournament for cadets held at Samsun (Trukey), Indian women grapplers won four gold, two silver and one bronze medals, he said. Mr Malik said the WFI was stressing on improving the infrastructure and had provided wrestling mats at 40 places. Besides, mats would be provided at 21 more places under the scheme of Ministry of Sports and Youth Welfare, Government of India. The WFI had also succeeded in getting the ‘akhara’ scheme re-introduced which will provide coach, wrestling mats and other equipment essentials for the development or wrestling at each ‘akhara’. The Government of India had adopted Ch Bharat Singh Memorial Akhara, Nidani, and Gol Bagh Akhara, Amritsar, besides providing equipment to Baba Farid Akhara, Faridkot, Gurukul Maha Vidhayalaa, Jhajjar, Lal Diwan Chand Akhara, Jhajjar and Mahavir Stadium, Akhara, Hisar. Above all, the WFI has also arranged the service of two foreign coaches. Andzrej Malina, (Greeco-Roman coach from Poland) and Vladimir Mestivirishvili ( Freestyle coach from Georgia) are actively engaged in training of wrestlers. He also revealed that the CII had also promised to sponsor the entire expenses of eight grapplers in different weight categories who were expected to win medals in Olympics. They would be subjected to rigorous training, including their exposure in international competitions and also training, abroad. Entire expenditure on coaching equipment, medical cover, insurance and travelling cost during training abroad and also board and loadging in the USA would be borne by the CII till August 2004 Athens Olympics.